Born in Kenya, Claire Foottit has travelled extensively in Africa. An Edinburgh University graduate in geography, including a post-graduate diploma in landscape studies, she has worked in design, PR, event management, magazine editing and photojournalism in the tourism and environmental fields. Claire's articles and photographs have been published in The Times, The Observer, The Scotsman, The Herald, Wanderlust, Travel Africa, Geographical, African Business and Msafiri. 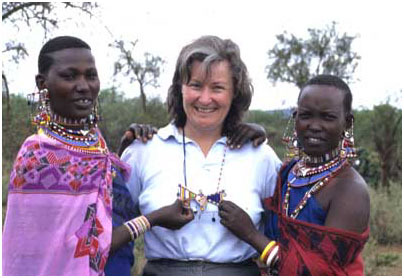 Author of the highly acclaimed Kenya: the Bradt Travel Guide she has also contributed to Insight Guides on Namibia, African Safaris and the award-winning Tanzania and Zanzibar. Her photographic exhibition, Faces of Africa, on tribal peoples, showed in London and Edinburgh. A fellow of the Royal Geographical Society, Claire is also a MKPSGA (B) qualified safari guide. A firm advocate of responsible tourism, Claire incorporates this in her work. When photographing people she seeks their permission first and gives a charitable donation on sales of ethnic images.